2015 marks the 30th year of the Movie and Television Review and Classification Board (MTRCB). 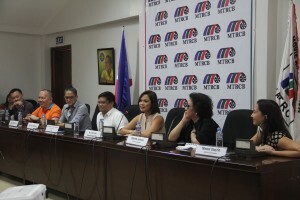 To kick off the celebration of its anniversary, MTRCB formally launched its new infomercial on 23 February 2015 at 2:00 p.m., MTRCB Building. 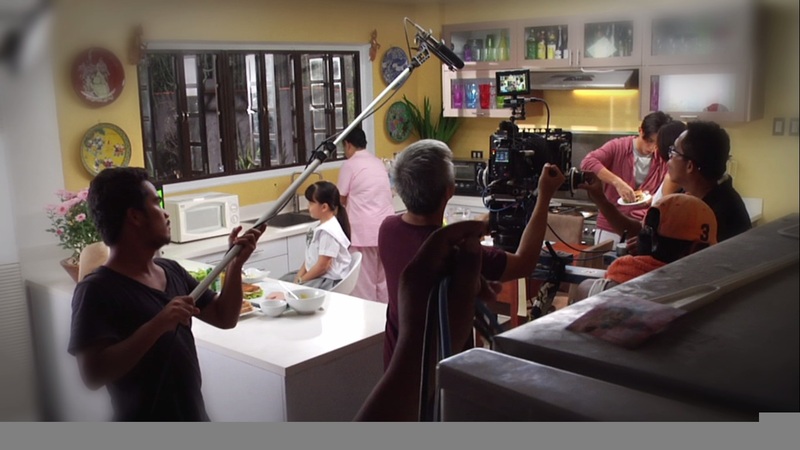 Directed by renowned film and television director Jose Javier “Joey” Reyes, Jr., DGPI and conceptualized by Mr. Erlito “Lilit” Reyes, the infomercial features actors-spouses Ryan and Judy Ann Agoncillo in a typical morning situation at home. In such scene, their depicted child picks up a word from a TV feature and asks the elders in the house what it means. The infomercial aims to challenge parents and responsible adults to be aware of the media content our children are exposed to, and to be mindful of the MTRCB’s classification ratings. Parents are also reminded that the primary duty in guiding their children as to the media the latter see still rests in them. 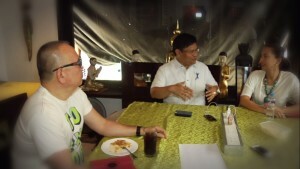 Tackle Football is fairly new to the Philippines, but they are fast growing. 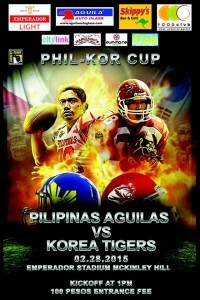 Currently with around 50 members that can be sent to exhibition games around Asia and the world, the Philippine Tackle Football team, known as Philippine Aguilas, will host a game at the Emperador Stadium this Saturday, February 28, 2015. With no support coming from the government nor major sponsors, our team has continued their training program out of love of the game. Funding has come out from their own pocket. If there is a definition of LOVE for the Game, then this must be it. 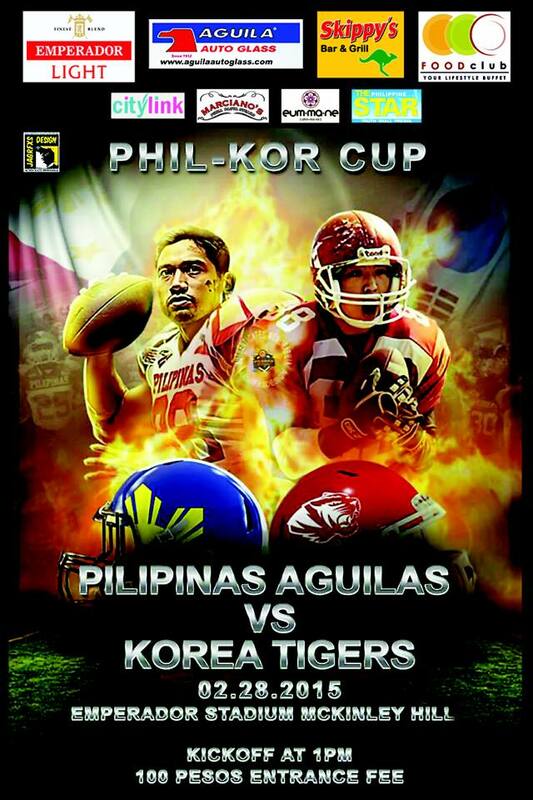 Coached by John Walker and assisted by Coaches Michael Bell, David Vannette, and Braendon Clay, Club Philippine Aguilas looks forward on beating the Koreans in a full game that will increase knowledge and mileage for the game here in the Philippines. We can support for our team by watching the gfame on site. The stadium’s entrance gate fee is P100 only. Emperador Light, Citylink Coaches, Skippys Bar and Grill, Aguila Auto Glass, Marciano’s Pizza Pasta Steaks, The Philippine Star, Food Club Buffet and Eum-ma-ne. Weekends, who do not love them? Para sa mga empleyado, oras ito ng pahinga. dalawa sa pitong araw na ginawa ng Diyos. Swerte ka kung magkasunod ang off mo. May iba dyan na tinatawag pa na split off. Meron din mga nagwo-work sa department store at sa mga malls na isa lang ang off sa isang linggo. Para sa amin sa BPO industry, this means double pay dates. Mas ginugusto pa ng mga nasa call center na nagwo-work sila pag holiday para sa holiday pay. 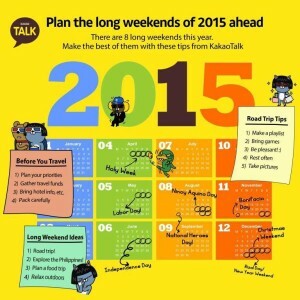 Ewan ko ba, buti na lang kahit ganitong mga holidays, bukas pa rin ang negosyo ko. Negosyante na kaya ako! 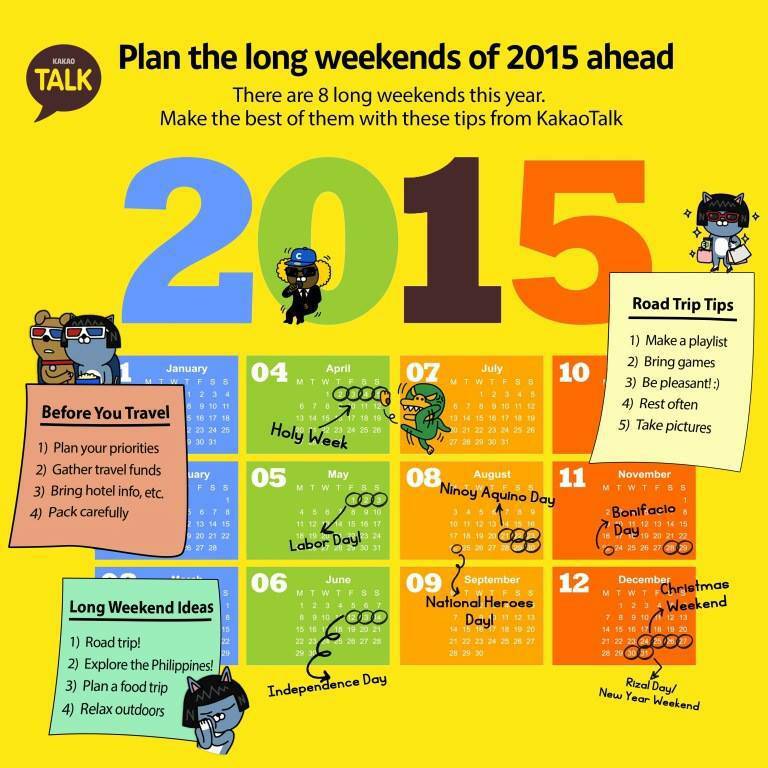 To share the news to the world, Kakaotalk made this fun infographic to remind us to relax every once in a while. We must not drop dead due to burn out. Go on, climb a mountain, hang out on the beach. Prepare for the dates where you will be free.